Dried Herbs/Flowers in a small bunch, your choice of set of 4 or set of 6 or set of 8. You will receive either 4 or 6 or 8 small bunches of the one you pick or if you want different ones, just choose custom and make a note in the notes section which herbs/flowers you would like. I'd be happy to make you a "Custom Blend" of herbs as well! Just let me know. I'd be happy to accommodate you. Bunches are approx. 6-8 inches tall. 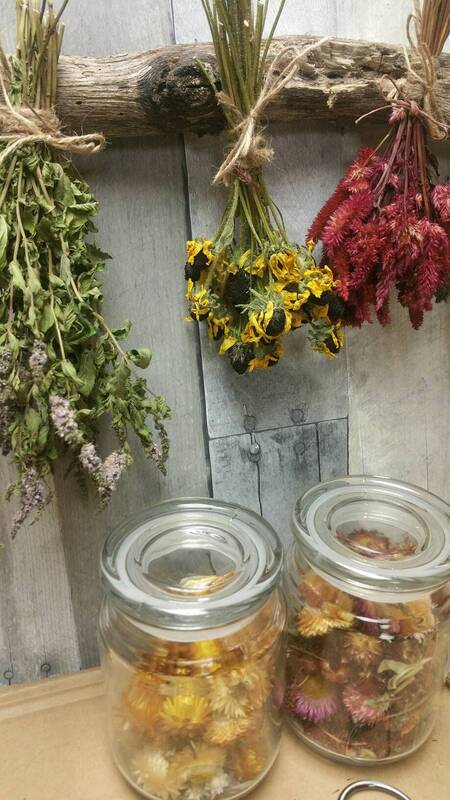 What you see in the picture(s) is some of my herbs/flowers drying. Please note, this is for the dried floral only, and does not include any other items, as pictured, as they are for display purposes only. These have not been sprayed, just naturally dried and kept in an ideal environment for storage until they are sold. They are packaged in a small bunch, tied with jute, ready to hang. If you want some herbs for tea, you can go to my other listing here. Custom orders are welcome, and I have many more kinds of dried florals available. Just ask. Great replacements for my Spring decor. This came out adorable. I did think they would be a little larger but as it turns out they work perfect.